Home > Week 11	> Your table is ready! Who has not waited for a table at a crowded restaurant before? It can get really frustrating especially when you are hungry. In fact, nearly 75 percent of customers say that waiting times are the most stressful part of dining out which can ultimately lead to a bad dining experience. 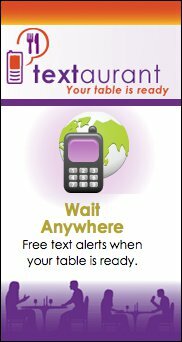 To improve the experience of having to wait for a table, Textaurant has developed a web-based waiting list management application that lets restaurants automatically inform customers via a text message when their table is ready. First, a restaurant pays an installation fee of about $1,000 but it can be free for long-term subscribers. Second, customers visiting the restaurant opt into the service when they arrive by giving the hostess their cell phone numbers. While this service can’t change how long you wait, it does allow you to leave the restaurant and wait wherever you want without worrying of loosing your table. On the other hand, the service doesn’t seem to me to be such a big idea because you still have to wait…but perhaps we are seeing such technologically advances nowadays that a little improvement is not enough. Another pitfall might be the privacy convern of giving away your cellphone number. But I think it is important to acknowledge the fact that restaurants and businesses in general are worrying about the customer experience. In this case, the experience begins waiting for a table. Textaurant is not the only company that is trying to help customers avoid frustrating lines. Startups like QLess, FreshTxt and MobileWait all use web-to-text applications to do something similar.